Smash Hit is a game built entirely around destruction. We knew from the beginning that destruction had to be fully procedural and also 100% reliable. Prefabricated pieces broken the same way every time simply wouldn't be enough for the type of game we wanted to make. The clean art style and consistent materials made breakage easier, since everything that breaks is made out of the same, solid glass material. Physically based breakage is hard. Really hard. I remember NovodeX had some kind of FEM approximation for breakage in the early days of PhysX, but it never worked well and didn't look very convincing. I think for most game scenarios it is also completely overkill, especially for brittle fracture, like glass. I designed the breakage in Smash Hit around one rough simplification – objects always break where they get hit. This is not true in the real world, where tension builds up in the material, and objects tend to break at their weakest spot, but hey, we're not really after accurate breakage here. What we want is breakage that feels right, and looks cool. 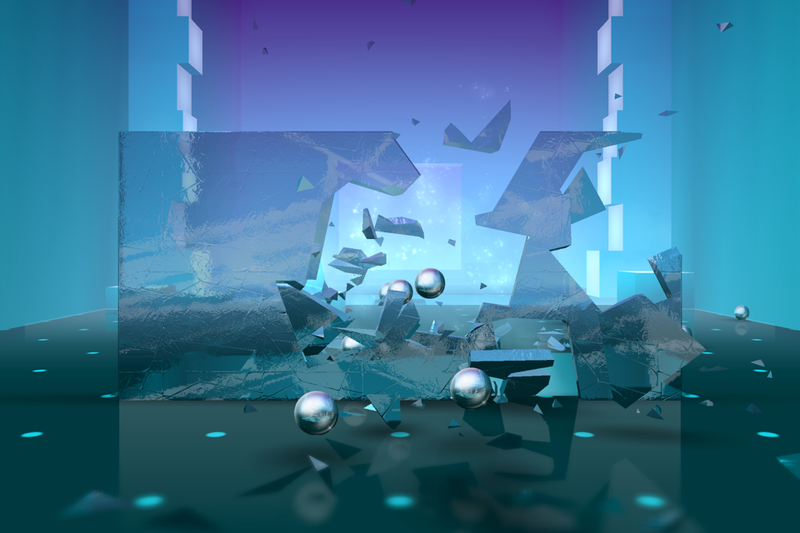 In Smash Hit, when a breakable object gets hit, and the exerted impulse is above a certain threshold, I carve out a small volume around the point of impact and break that up into several smaller pieces that become new dynamic objects. Check for topology changes in the original object. Carving out a piece may cause it to fall apart. Carving out a volume from a generic mesh in a robust way is a really complex geometric problem. Furthermore, since every object in Smash Hit is physically simulated we want the resulting objects to be well-behaved in a physics-friendly format. From a physics point of view, I represent all objects as compounds of convex shapes, so the resulting broken object must also be a collection of convex shapes. Luckily there is one safe way to split up a convex object into two new objects that are also guaranteed to be convex – slicing it with a plane. So to carve out a piece from the original object, I slice all the convex shapes with five bounding planes, slightly randomized around the point of impact. It will increase the total number of convex shapes used in the original object, but that is inevitable due to the fact we are making the object more concave. It takes a bit of bookkeeping to get the splitting code right, but as long as the plane splitting is robust, so will the overall breakage algorithm. The carved out piece can be split up into smaller pieces using the same plane-splitting, so all we need is a really fast, reliable plane-splitting method for convex objects. The classic problem with plane-splitting is not handling degenerate cases. Say for instance one of the faces coincide with the splitting plane, so that only one edge crosses the plane due to floating point precision. That can easily result in degenerate geometry, non-closed polyhedra or even broken data structures and hard crashes. To avoid that, I start by determining a side for each vertex (above or below the plane) and then base all edge-splitting on that information, hence only split an edge if the corresponding two vertices are on opposite sides of the plane. The split point for each edge is capped to be a certain distance away from both vertices, so that the resulting two shapes are always closed, well-defined and all edges are above a certain length. I tried quite a few data structures for doing the plane-splitting before finding one that works well in practice. The biggest hurdle was that I needed a way to track vertices through multiple splits in order to keep vertex normals consistent. It might not be visible at a first glance, but vertex normals are used extensively to make nice gradients in the glass rendering and create a certain softness to the material. Recomputing those normals after splitting an object would create a deviation in the material that is very visible to the player. In the end, the half-edge data structure turned out perfect for the job, offering both high performance and very small memory footprint. I even use 16 bit integers instead of pointers to keep the size down. After carving out a hole in the object, it needs to be checked for topology changes. Depending on the shape, it might have been split into two or more separate objects. Finding connected components in a series of inter-connected nodes is classic graph theory. What makes out a connection in this case is wether two shapes are touching face to face. The most elegant way to do this would be to track split faces between shapes and remember the connections, but it takes a lot of bookkeeping. I'm using a more pragmatic approach, where the distance between shapes are measured geometrically. I have earlier on this blog written about the GJK algorithm and how immensely useful it is for all kinds of geometric operations. In this case, we only want to know if two object are within a certain distance of each other. This can be done as a simple overlap test in configuration space, which is extremely fast. 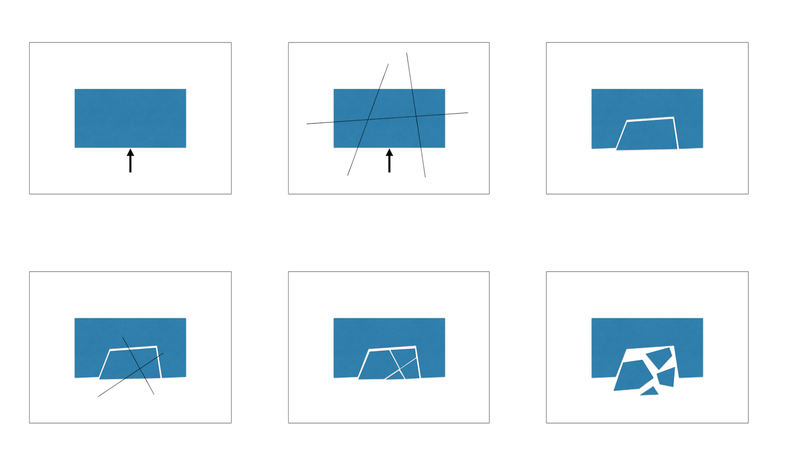 After we're done all shapes with the same id represent the same rigid body. This is obviously not a very fast general algorithm due to cubic complexity, but since the number of shapes in a rigid body is usually within a few dozen it works well in practice. The nice thing about it is the complete lack of state, which simplifies further breakage. This means that objects are created and broken several times during a simulation step before proceeding to integration. I have capped the number of solves per simulation step to three in order to limit performance impact. This is the first game where I'm giving my low level physics engine a proper work-out. It has been in development on and off for almost four years so it's great to finally see it in action. Good destruction ties very deeply into the simulation pipeline, so it's not ideal to plaster it on top of an existing physics engine. Hi Dennis! I'm delighted to see such a well made game become extremely successful. Well-deserved! You write that you use 16 bit integers to save memory. I read elsewhere that 16 and 8 bit variables take a performance hit on a 32 bit ARM processor because the data is padded before use. Then some third source said this isn't so. Now I'm confused. Do you know what the deal is? Interesting! I haven't heard of that before, so I don't know if that's the case. I generally see a performance boost when data size is minimized due to better cache utilization, but I haven't clocked this case specifically. Thanks a lot for the info and excellent to see the game doing so well too. Very awe-inspiring Dennis! I could never really put my finger on what made the engine feel so darn good, but when you mentioned the perservation of movement upon impact, it just made sense! Can you recommend any further reading that has helped you during the years? Will you add the gameplay mode and levels from the gameplay teaser and screenshots? Hi Elliott, that's a very sharp eye! No, I don't think those will be added. We tried out a lot of different game modes and score models, and they all had various problems (separate blog post on that coming up), so I don't think we will go back and add them, not saying there won't be new game modes in the future though. Thanks Erin, I'm sure there is some overlap at times, but it's hard to see as the camera is constantly moving. Good to know about the destruction in gaming. I think even that's an art one should possess and it would be possible only to people who have innovative thoughts in gaming. To get these innovative ideas one should have done their game development courses which are readily available in many game development institutes. Just a quick question how was the general performance of bullet physics in the game did it need any special optimizations. What are the average sub-steps used in the game ? When I implemented bokeh depth of field I stumbled upon a neat blending trick almost by accident. In my opinion, the quality of depth of field is more related to how objects of different depths blend together, rather than the blur itself. Sure, bokeh is nicer than gaussian, but if the blending is off the whole thing falls flat. There seems to be many different approaches to this out there, most of them requiring multiple passes and sometimes separation of what's behind and in front of the focal plane. I experimented a bit and stumbled upon a nice trick, almost by accident. I'm not going to get into technical details about lenses, circle of confusion, etc. It has been described very well many times before, so I'm just going to assume you know the basics. I can try to summarize what we want to do in one sentence – render each pixel as a discs where the radius is determined by how out of focus it is, also taking depth into consideration "somehow". After finishing my framework overhaul I'm now back on hybrid rendering and screen space raytracing. My first plan was to just port the old renderer to the new framework but I ended up rewriting all of it instead, finally trying out a few things that has been on my mind for a while. I've been wanting to try stratified sampling for a long time as a way to reduce noise in the diffuse light. The idea is to sample the hemisphere within a certain set of fixed strata instead of completely random to give a more uniform distribution. The direction within each stratum is still random, so it would still cover the whole hemisphere and converge to the same result, just in a slightly more predictable way. I won't go into more detail, but full explanation is all over the Internet, for instance here. Let's look at the difference between stratified and uniform sampling. To make a fair comparison there is no lighting in these images, just ambient occlusion and an emissive object. I often see people recommend the command pattern for implementing undo/redo in, say, a level editor. While it sure works, it's a lot of code and a lot of work. Some ten years ago I came across an idea that I have used ever since, that is super easy to implement and has worked like a charm for all my projects so far. Every level editor already has the functionality to serialize the level state (and save it to disk). It also has the ability to load a previously saved state, and the idea is to simply use those to implement undo/redo. I create a stack of memory buffers and serialize the entire level into that after each action is completed. Undo is implemented by walking one step up the stack and load that state. Redo is implemented in the same way by walking a step down the stack and load.